We can see clearly now and can’t wait to share what we discovered once we put on our new glasses. Back in February I wrote a post about choosing a new pair of glasses. It was a metaphor for being able to look at our industry from a new perspective. I reviewed how times had changed and encouraged photographers to be thinking of new ways to participate in this new world. A few weeks later, our office hosted a group meeting for our photographers. The point of the meeting was to get our entire group on the same page. We needed to make sure everyone was up to speed on how things have changed and how people were utilizing photographers now so that we could stop talking about the changes and start participating. 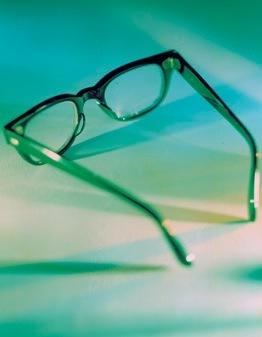 We wanted to help our photographers reframe how they see their own businesses and provide them with their new glasses. In order to do this, we enlisted the support of Michael Coutrous of evolutionStudio to help shape what we wanted to say and choose the most relevant tools to help them succeed. He was instrumental in helping our group transition from the then into the now. Michael and I agreed that the entire premise of the meeting should be about shifting the photographer’s mindsets so that they could have a new understanding of the industry and be able to identify the emerging opportunities in this new media market. Instead of seeing the challenges of this new world, they needed to see the opportunities. To help facilitate this we shared with our photographers a variety of new perspectives /glasses through which to view the industry. We asked them to try on those glasses throughout the meeting while we presented new opportunities to them. We encourage them, with those new glasses, to see which tools work best for them, make choices towards change and prioritize. Mindset vs. Small Business Mindset. Michael and I explained that this was the only mindset that would work in this new emerging media market. Michael was the expert in this area and explained that the basic premise of this concept is that if you are a small business owner you are concerned with filling a well established, clearly defined market need. If you are an entrepreneurial business owner, you seek new opportunities to provide value on the evolving frontier of market needs. To help us understand this concept better, he suggested that we think back on recent conversations with clients. He asked us to ask ourselves, “what are the new challenges they are facing? What are the new needs that they have?” He explained that if we understand clearly their challenges and emerging needs, that we can usually discover a new opportunity to provide value for them that costs us little to nothing, that they will be very happy about. Basically, it is all about thinking about your business differently, trying to break the mold, and being the person who is offering new ideas and shifting expectations. The rest of the meeting was spent evaluating each one of our marketing tools through our new glasses. We reviewed each tool through the old glasses and then examined them more closely with our new glasses. We spent time brainstorming how to approach portfolios, emails, direct mails, source book advertising, portfolio shows and web presence as well as many other tools differently. Since then, our photographers have been working to evolve those tools to show that they are understanding this new media market and want to be part of shaping the future and their businesses. As you can imagine, this change takes some time but they are all prioritizing and embracing those tools that work best for them. They are open to new ideas and constantly thinking about how to make their own businesses move forward. Over the next few weeks, our photographers will be ready to share their new ideas for direct mail, emails, portfolios, websites, advertising and other tools. They have found their new glasses and are wearing them excitedly. Please be sure check back to see what changes have evolved. This entry was posted in Name Dropping, Notes From A Rep's Journal and tagged Name Dropping. Bookmark the permalink. Hunter Freeman makes complicated seem effortless. Here are 4 tips for a successful photo shoot.